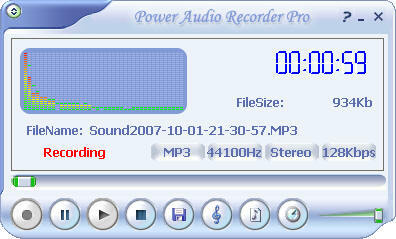 Power Audio Recorder Pro supports 8000, 11025, 16000, 22050, 32000, 44100, 48000Hz, Mono/Dual Channels/Joint Stereo/Stereo. It is equipped with a built-in player, a playlist and enables users to cut and join MP3 files, record music to WAV/MP3/WMA files from cassette tapes and singles from LP directly while playing, record voice from MIC, sound from Internet Radio, tracks from CD and sound from any other source, such as radio, TV, CD player. Users can also record sound from any multimedia software and games directly. The program has been developed to easily guide users through the process of recording. It is equipped with Record Wizard, which enables you to take advantage of the variety of recording functions immediately after the launch. You will not be confused by the number of options, as the interface is provided with user-friendly bubble help, showing all the information you need to know to make the right decision and press the right button. Unlike many other products in its category, Power Audio Recorder Pro supports multiple sound cards, includes flexible voice activation system and provides users with multiple schedule support. Version 1.60 also includes ID3 Tag Editor for MP3 files. Power Audio Recorder Pro has been developed to address all requirements of audio recording enthusiasts, as well as professionals who are in need of high-quality, yet simple recording software.You can also edit your recorded voice and audio,include amplify +/-, fade in/out, normalize, insert silence. If you want to burner recorded sound to Audio CD,click here. If you have problem to record in windows vista/windows 7,please click here. Record any signal played through your sound card into MP3 ,WMA or WAV files. 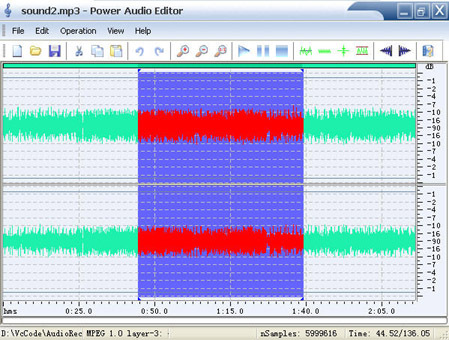 MP3 file Cut support,split a MP3 file into more MP3 files. MP3 file join support,join more MP3 files into a MP3 files. Send voice email to your friends. ID3 Tag Editor for mp3 files. Edit audio file,include amplify +/-, fade in/out, normalize, insert silence. What sources of the sound you may use with our Power Audio Recorder? Record Music to WAV/MP3/WMA files from your cassette tape directly. Record Singles to WAV/MP3/WMA files from LP(long playing record) directly while playing. Record Voice to WAV/MP3/WMA files from MIC directly. Record Sound to WAV/MP3/WMA files from Internet Radio. Record Tracks to WAV/MP3/WMA files from CD audio directly while playing. Record Sound to files from any other sound line in such as radio , TV , CD Player ,DVD Player directly.